Cuireann duanaire Calling Cards (The Gallery Press, 2018) glúin nua na bhfilí óga atá ag scríobh i nGaeilge, le haistriúcháin ar fáil i mBéarla, i láthair do lucht léitheoireachta níos leithne. Tá áthas ar Chúirt beirt fhilí le saothar sa chuasach seo, Aifric Mac Aodha agus Proinsias Mac a’ Bhaird, a chur i láthair. Léifidh siad a gcuid filíochta i nGaeilge agus i mBéarla i gcuideachta cheolmhar ár gCeoltóir Chónaitheach na Féile, an píobaire cáiliúil, Ronan Browne. The Calling Cards anthology of younger poets writing in Irish, with translations into English, (The Gallery Press, 2018) introduced a new generation of Irish-language poets to a wider audience. 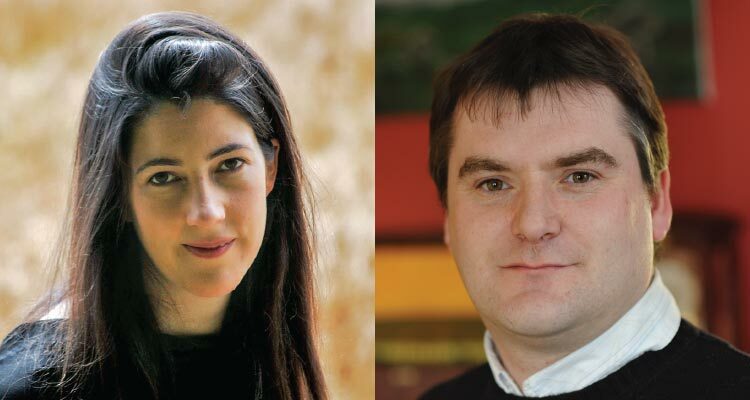 Cúirt is delighted to present two of these poets, Aifric Mac Aodha and Proinsias Mac a’ Bhaird, who will read their work as Gaeilge and in translation, in collaboration with Cúirt musician-in-residence, renowned uilleann piper, Ronan Browne. Rugadh Aifric Mac Aodha i nGaillimh i 1979. D’fhoilsigh An Sagart an chéad chnuasach filíochta léi, Gabháil Syrinx, i 2010. D’fhoilsigh The Gallery Press an chéad chnuasach dátheangach léi sa bhliain 2017 (David Wheatley a d’aistrigh). Sa bhliain 2018, chuir sí féin agus Peter Fallon Calling Cards in eagar, cnuasach dátheangach ina bhfuil bundánta Gaeilge ó pheann deichniúr filí den ghlúin nua mar aon le haistriúcháin ó fhilí aitheanta as Éirinn. Aifric Mac Aodha was born in Galway in 1979. Her first collection, Gabháil Syrinx, was published by An Sagart in 2010. Foreign News (with translations by David Wheatley) was published by The Gallery Press in 2017. In 2018 she co-edited Calling Cards, a bilingual anthology of younger Irish-language poets. Is as Árainn Mhór i dTír Chonaill do Phroinsias Mac a’ Bhaird. Bhain sé duaiseanna dá chuid filíochta ag Féile Idirnáisiúnta Bhéal na mBuillí, Comórtas an Choirnéal Uí Néill agus Oireachtas na Gaeilge. Ba é Bealach na Mine Buí an cnuasach filíochta ba dhéanaí uaidh. Foilsíodh úrscéal úr dá chuid Tairngreacht i mí Eanáir. Proinsias Mac a’ Bhaird is from Árainn Mhór in the Donegal Gaeltacht. He has won prizes for poetry at the Strokestown Poetry Festival, The Colonel O’Neill Prize and the Oireachtas na Gaeilge poetry competition. His most recent collection is Bealach na Mine Buí. His latest novel Tairngreacht was published in January. “If the subject matter of Mac Aodha’s poems is serious, the images that are dotted throughout the volume are engaging and contemporary, they include a laconic DJ, Marilyn Monroe and her voluminous skirts and the crackle of electricity.” – Clíona Ní Ríordáin, The Irish Times, Dec 2016.